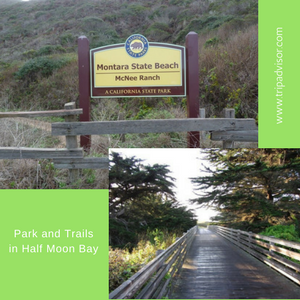 If you are looking for a place with a stunning view of the ocean while biking or strolling around, Halfmoon Bay Coastside Trail might just be right for you. Its paved trail makes it easy for people to do brisk walking or a hassle-free biking. This 7.7 mile trail parallel to the Pacific Coast is definitely a sight to behold. The trails easy access to the beach makes it a good combination for surfers and bikers alike The scenic view of the ocean and hanging cliffs can be enjoyed by everyone while bird watching or simply nature viewing. Families and cliques can go here for a literal walk in park. Its easy to moderate trail makes it perfect for everyone. And if you are that type who is not into these activities, you can do a short leisure walk or sit on the bench while listening to the crashing of the waves from the ocean. If you are looking for the best place to train for your next backpacking trip just around the bay area, well look no further, Purisima Creek Redwoods Preserve is highly recommended for a great hike for you and your friends. Lots of redwoods provide visitors with shaded hike as the sun will not directly hit you as you go through a lot of uphill climbing(and downhill ofcourse). Adding to the challenge other than the uphill and downhill climb are the narrow and wide paths. At some point in the trail, hikers will get an astonishing view of the bay area, just the perfect time for come picture taking and a short rest. Well-marked trails provide hikers an idea of the mileage and how much more to take. Banana slugs, blackberry vines and ferns are almost everywhere. Animals like rabbits, deers and a lot more will also greet you during your hike, too. Truly, a lovely biodiversity. This hidden gem near Halfmoon Bay should be on everyone’s list to visit. McNee Ranch is every mountain biker's favorite because of its rugged slope. Definitely a great spot for horeseback riding, biking or just contemplating the view. Animals and birds are abundant here, plus a diverse area of grassland and coastal scrubs, too. The park is almost totally exposed with few to none sheltered spots, so ready yourself from the scorching heat of the sun. For more info, contact State Park main office at Half Moon Bay at (650) 726-8819.